Two things have helped me to do this – a rather warm and dry winter and great, free audio books and podcasts to listen to on my Android smartphone. As the weather warms and the sun sets later (Daylight Savings Time begins next Sunday), perhaps you’d like to walk or exercise outside more frequently? The first place to check for audio books is OverDrive. Many libraries have contracted with this ever-growing ebook and audio book provider to be the conduit for content checked out via a typical library card. Both of our local library branches provide materials through this site – albeit with slightly different collections. The Android app for it works pretty well and it gives the option of either streaming or downloading the content via WiFi. I do find some aspects of its functionality to not be completely intuitive, so you might have to play around with it a bit. 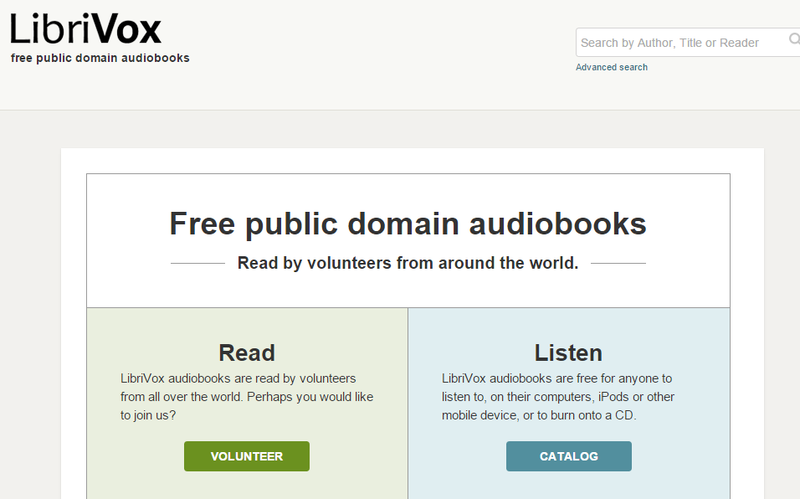 Another good source for free audio books is LibriVox. The collection here is mainly classic works that are in the public domain. So, if you’re seeking to listen to works that you skimmed in high school, but as an adult you’re now curious about, this is your source. I started my walking routine with audio books, but now I listen almost exclusively to podcasts. In case you’ve not been paying attention, there’s a remarkable renaissance happening in the audio programming world. I find this ironic. We’re now in such a visually-oriented streaming world as television supplanted the radio more than sixty years ago. Yet, those same devices you can use to watch Netflix, can also be used to stream a ridiculous amount of audio content as well. And on the supply side of the equation, the equipment needed to create a podcast is so minimal that anyone with a computer and a $20 plug-in-mic can become a podcaster. Sure, there’s a lot of amateurs out there, but a growing number of podcasters are gaining wide notoriety and significant earnings. 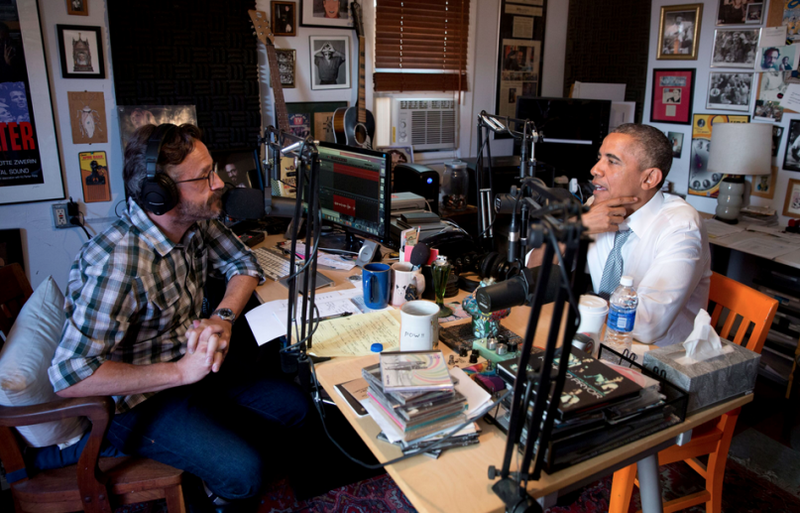 A good example is Mark Maron’s WTF Podcast and his interview with President Obama last June. The visual design of Pocket Casts is far superior to any other podcasting app that I’ve used. More importantly, it is extremely easy to download via WiFi and then stream on-the-go. The user interface is highly intuitive. So, whether you’re brand new to listening to podcasts or a veteran, pay the $3.99 for this great app and you won’t regret it. So, how do you find good podcasts? Before I tell you about the aforementioned two favorites of mine, let me give you two sites to visit to find virtually any type of podcast you can imagine. A pretty amazing one, which I stumbled across just last night is Podcast Chart (pictured above). A glance at the (partial) sidebar listing categories gives just a taste of the range of possibilities. So, you found some interesting sounding podcasts and you’re surprised to discover that the number of episodes in the various archives is staggering. How can you find a particularly good episode? This is where NPR’s recommendation site (with weekly email) Earbud.fm comes in. Incidentally, these two sites will allow you to podcast directly through their interface. 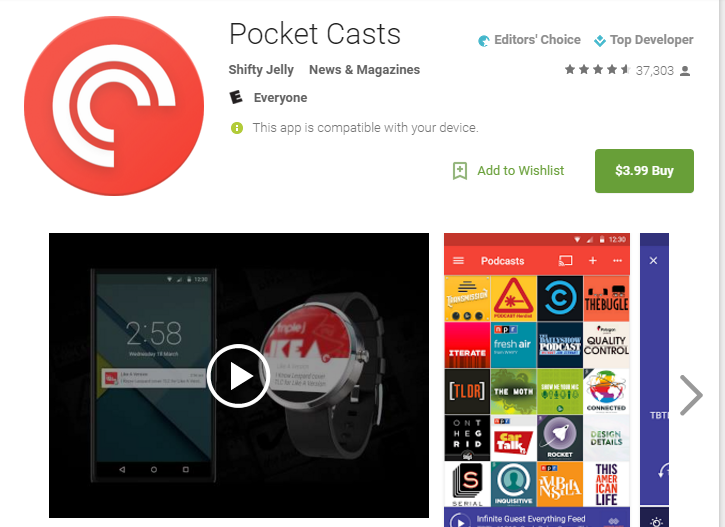 While this might be convenient, I still prefer finding them in Pocket Casts and listening there. You can read the premise in the screen shot above or you’ll hear it repeated at the top of each episode. I’m just enough of a Narnia fan/geek that I really appreciate the humor in this podcast as they explore and explode the many “fantasy story” tropes. The language and humor is mostly PG-13 (at least in the dozen or so early episodes I’ve heard thus far). This is just one branch of a large network dedicated to information – mostly of the trivial kind. In this podcast four of their British and Scottish researchers/comedians share interesting facts they’ve recently discovered. Not only do I learn from their conversations, but I bust up at both the jokes and the connections they make. I’ve been listening to other podcasts as well and I’ll likely devote another post to recommendations sometime. At this time, I need to do the dishes – with my wireless Bluetooth headphones (I use and recommend these, purchased via Tanga) and an interesting and funny podcast in my ears. I missed getting a Sun(Fun)day post out yesterday. Turns out that there are only so many hours in the day and yesterday they passed by way too quickly. So, it’s Monday, sunny here in Ohio, we’re on the 250th post at this blog and it’s a good day for celebrating the miracle that is our eyes! If you’re like me, you change your device’s wallpaper or background image frequently. I like to enjoy that moment of beauty before I get to whatever app or task I’m seeking. So, for your viewing pleasure here’s a few of my favorite sites for downloading beautiful images and a recent example of each. So after I stop at Bing’s site, I go over to my next favorite site for daily images as well as great, daily prayer resources. Hosted my the Jesuits of the Midwest Province, the location of the site is Jesuitprayer.org. Each day they offer a gripping image paired with a quote related to the liturgical reading and related reflection for the day. There’s also an iOS app available. The images aren’t always in the highest definition, so sometimes they are a bit fuzzy on my iPad lock screen. Still, the reflections included are worth pausing on for a moment before unlocking and moving forward. One really good thing about the file (above) from Loyola is that it fits perfectly onto the iPad screen while the Three Minute Retreat one needs to be reduced. As a bonus, if you’re looking for lock screen images and home screen organization on your Android device, may I recommend what I use – Picturesque and Aviate respectively. Scrolling back through recent posts, I see that it’s been awhile since I’ve shared about nuts and bolts technology which can make life better for educators – inside or outside of the classroom. So, here’s a quick post about cool and useful ways to utilize Google tools. First, how often do you use Google Now on your phone, tablet or Chromebook? I don’t look at the “cards” or use the voice activated search (the “OK Google”) as often as I could. But now, having discovered this amazing list of functions, I’ll surely use it with greater frequency. If you’re too lazy to scroll this list, you can also access a list of voice commands on your phone by tapping the mic and saying “show me what you got”. BTW: The Google Image above is not from my Google Now, although I wish I was in San Francisco today! What makes a perfect day for an educator like me (and you too?) – A SNOW DAY (sort of)! Well, I went to bed last night suspecting the possibility and woke up at 5:30 am confirming it. Lately though, here in Central Ohio, we’ve had more “calamity days” the past couple of school years due to sub-zero temps with wind chill rather than because of the more traditional – ice/snow covering the streets in the early morning. On a day such as this, I’d much rather be either creative or lazy rather than productive. In other words, I’d rather write or read instead of grade (the 50+ freshman mid-term essays from before Christmas Break). So, I’m going to create a few posts here and also over at my personal blog too. And I have until Tuesday of next week to get those essays graded! What makes your perfect day? One thing high on my list is echoed in this great list from Lifehack at #11 – “Take a walk in nature.” I’m hoping to do this today – so that I can meet my Fitbit goal of 10,000 steps for today. But, my WeatherUnderground iPad app tells me that it’s currently 15 degrees, but it feels like 7 degrees. Ugh – I may have to go for a walk indoors at a nearby mall instead. 1. Once you wake up, just stay in bed for a couple of minutes and relax. 2. Always have a book with you, we never know when boredom might decide to appear. 3. Set mood playlists on your device of choice. 4. Close your eyes and breathe deeply. 5. Smile to a stranger and see what happens! 6. Have a quick fresh shower first thing in the morning. 7. Show your love to someone else. 8. Before you go to bed, say thanks for everything you have and don’t have. 9. Connect to yourself, by using a journal: write, draw, make collages, let your mind wander. 10. On your nightstand, put something that makes you smile. 11. Take a walk in nature. 13. Make a to-do list to help you achieve your main goal for the day. And stick to it. 14. Eat healthily and accordingly to your own taste. 15. Take an hour and do as you please. 16. Write 3 good things that happened to you and what you can do to see it happen again. 17. Put some fresh flowers in the room you spend time in the most. 18. Take a long and warm shower before going to bed. 19. Get out of the house and explore your neighborhood. 20. Sleep naked to feel sexier. 21. Boost your confidence by engaging in your favorite hobby. 22. Act crazy, put the music on loud and start dancing like there’s no tomorrow. 23. Take a 30 minute nap after lunch; as an alternative, engage in a different relaxing activity. 24. Giggle with your friends– make time for them in your day. 25. Read an inspiring quote and incorporate it into your day. 26. Declutter you life by asking “Do I really need this? Why?”. 27. Be kind anytime you can and don’t expect anything back. 28. Meditate and write down everything you’ve found out. 29. Learn something new, even if it’s just a different way of doing stuff. 30. Have some sweat and exercise. Do it mindfully by choosing an activity you enjoy. 31. Sleep a bit more if you feel tired or you’re in the middle of a situation that you can’t solve. 32. Smile. Smile. Smile. And smile some more. 34. Experience flow by working at something you’re passionate about. 35. Make your surroundings a little bit better: declutter, reuse and recycle. 36. Plan a trip, even if you can’t travel right now. 37. Be aware of your emotions, but don’t control them: understand them. 38. Remember your accomplishments every time you feel like a failure. 39. Lower your expectations, little by little — most of them are unrealistic. 40. Be offline for as long as you can. 43. Don’t worry about your problems, but work toward a solution. 44. See everything as an opportunity to learn and grow. 45. Forgive yourself and forgive others. 46. Don’t quit: make baby steps. 49. Put everything you are into everything you do. Loyola Press has an engaging Arts & Faith set of Advent Resources while the home page for all of their Advent resources is here. How about iOS and Android Apps to either create or access Advent calendars and other resources? Learn about these here and here. Have a blessed and meaningful Advent season! Just a quick post to share an interesting, free app I discovered this evening. The good people at the venerable Our Sunday Visitor present the 365 Days to Mercy app. It’s available for both iOS and Android. If you have an iPad and you search the App Store for it, you’ll need to search for “iPod Only” to see it and download it. I’m excited what will hopefully be a transformative Jubilee Year of Mercy. This app looks like a good way to celebrate it. And, you’ll note that I’ve added a count-down timer to the left column so we can see how many days until the Jubilee begins! A few months ago, I posted a list of links related to the Google universe. It happened to be the 100th post. Now, we’re approaching 150 posts and I thought it was time to send out another, updated list of Google items. A couple of notes. First, I did not renew my Office 365 account when it expired a month ago. The $70 or so they wanted for another year wasn’t worth it to me. So, I’m planning on migrating all of my files over to the Google trio exclusively. I mention this as I’m keeping an eye out for useful posts on Docs, Sheets, and Slides. Next, my school does not use Google Classroom as our LMS is Buzz, built on the platform of BrainHoney. I note this as I generally don’t look out for Classroom postings. You may see one or two in this list, but it’s not a focus for me. Explain Everything – On Chromebooks! Enjoy the wide ranging list! You’ve likely noticed that I like sharing lists of educational apps and websites. There’s been these types of lists from the early days of this blog and I’ll be posting some new ones soon. Most of these come from blogs and publications geared specifically to educators. When general publications, such as the venerable Time Magazine, list “must have” educational apps, I’m especially interested. Lists like this one give valuable insight into what the “media taste makers” deem as important. Note: I’ve not hyperlinked these apps as the Time article does this for iOS and Android versions.